ZAPASKA concert in Bucharest at Dianei 4. 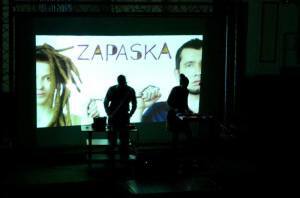 Zapaska is electro-acoustic indie-pop duo, based in Ukraine. Two performers (Yana Shpachynska and Pavlo Nechytajlo) create music with the help of traditional instruments and electronics. Influences of rock, hip-hop and folktronica may be traced in this music, which is generally based on Ukrainian melodic. "ZAPASKA Concert @ Dianei 4" Concert in Bucharest. You can get here description, reviews, address, time and details of "ZAPASKA Concert @ Dianei 4" Concert in Bucharest. Visit Bucharest Tips for more Concert events in Bucharest!